Get out of town with these interesting Brisbane side-trips: Sea World Theme Park (in Main Beach), Warner Bros. Movie World (in Oxenford) and Surfers Paradise (SkyPoint Observation Deck & Surfers Paradise Beach). The adventure continues: get your game on at South Bank Parklands, identify plant and animal life at Lone Pine Koala Sanctuary, admire the natural beauty at Brisbane Botanic Gardens Mt. Coot-tha, and explore the world behind art at Queensland Art Gallery. 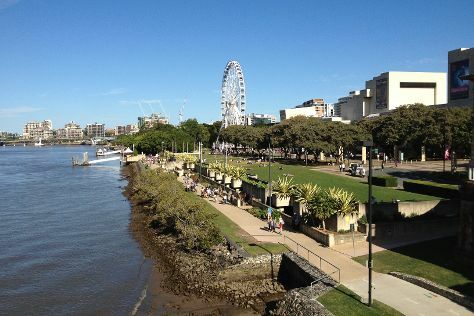 To find reviews, photos, more things to do, and tourist information, you can read our Brisbane trip planning site . The Route module can give you travel options from your home to Brisbane. Expect a daytime high around 25°C in August, and nighttime lows around 11°C. Wrap up your sightseeing on the 5th (Thu) to allow time to travel to Port Douglas. Explore the numerous day-trip ideas around Port Douglas: Cape Tribulation (Daintree Rainforest - Cooper Creek Wilderness, Myall Beach, & more), Alexandra Bay Waterfall (in Diwan) and Walu Wugirriga Lookout (in Cow Bay). Spend the 6th (Fri) among aquatic life with a scuba or snorkeling tour. Spend the 8th (Sun) spotting exotic species with a safari tour. Next up on the itinerary: explore and take pictures at Hartley's Crocodile Adventures, kick back and relax at Four Mile Beach, explore the striking landscape of Mowbray National Park, and identify plant and animal life at Mossman Gorge. For traveler tips, more things to do, and tourist information, refer to the Port Douglas trip itinerary builder tool . Do a combination of flight and shuttle from Brisbane to Port Douglas in 6 hours. Alternatively, you can do a combination of bus, flight, and shuttle; or drive. Plan for somewhat warmer temperatures traveling from Brisbane in September, with highs in Port Douglas at 33°C and lows at 22°C. Finish your sightseeing early on the 16th (Mon) so you can travel back home.